The beginning of the third week on excavation was dedicated to our Egyptian find (compare chapter 1). 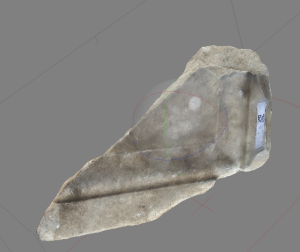 First step was to document our little greenish-black stone-fragment with hieroglyphs, an offering plate for sacrifices by hand-drawing and digital 3-D-modelling (see picture below). The back-side showed an interesting detail for the interpretation: our sacrificial plate could have been part of a statue, which is proved by a partly broken fingertip from the statue-hand holding the plate (see picture below: located in the same position as our fotographer’s fingers). 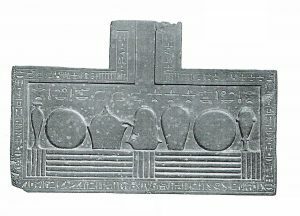 The complete sacrificial tablet could have looked like one of the comparisons Gunnar showed us (see picture below left). 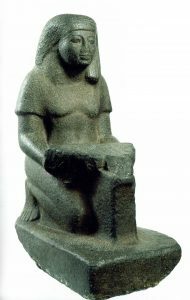 The whole statue may have been similar to the typus of an offering person, well-fitting to a sacral context – at least in Egypt itself (see picture below right). Its find-spot in a cleared-up material-dump from a temple in Ostia (most probably the Capitolium because of its equally fragmented architectural decoration nearby the find spot) remained however open to suggestions – maybe it had been a gift from one of the rich Egyptian merchants or some kind of ambassador to the main gods of the city? In the old excavations of 1861-72 – under the aegis of Pope Pius IX – the fundament of the Capitolium was freed from earth (Paschetto 1912). 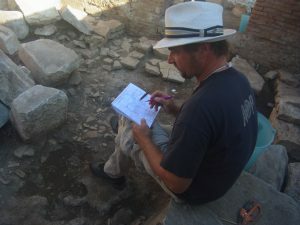 After the excavation back home in Berlin, Axel read the report of Paschetto regarding these previous finds from the Capitolium and suddenly realized a convenient coincidence, which of course still has to be verified or falsified based on detailed study of the early finds themselves. 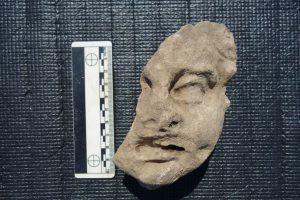 Does the fragment really fit to the find in 1864 of “una figura in basalto verde con geroglifici egiziani” or other Egyptian sculptures of the same find-context? 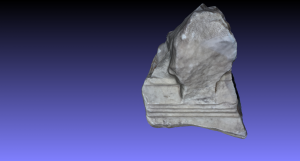 In this case, we would have a safe dating-clue for the depositing-process of the complete upper part of our marble-deposit TFR 2: It could have originated latest at the same time as the deposit in the podium of the Capitolium nearby (see picture below: temple in background). 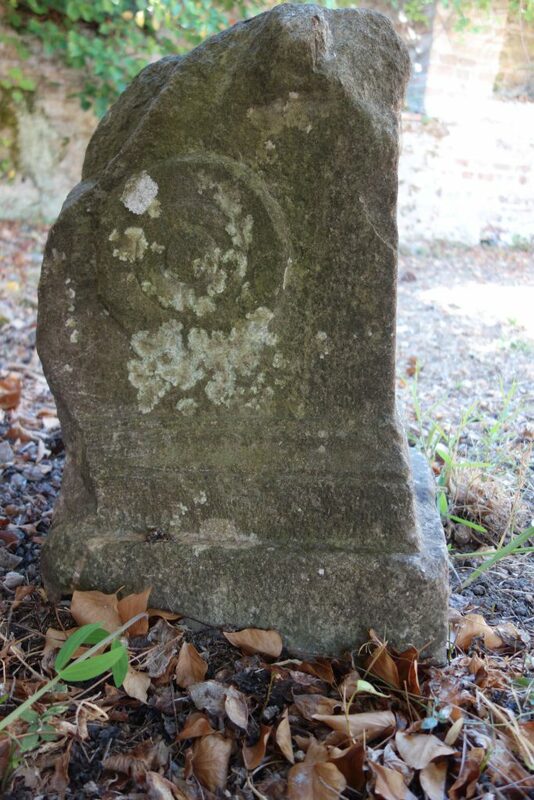 This would be a terminus ante quem for both surely before 1861, the time of these excavations. 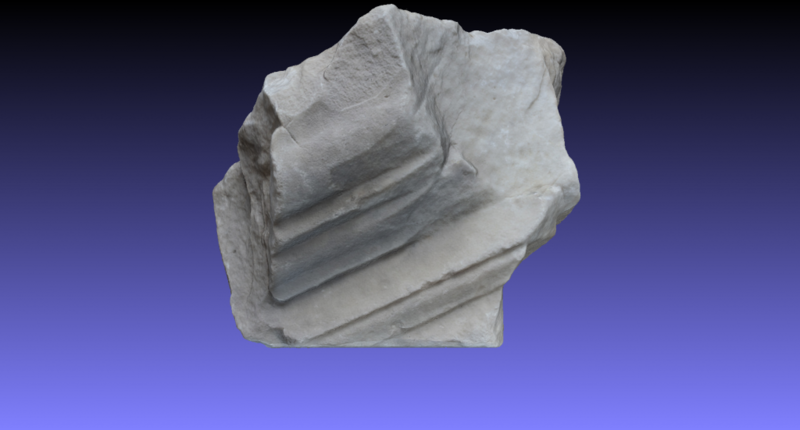 In the upper part of TFR 2, consisting only of marble-pieces, no earth or stratigraphy with dating-evidence was preserved in situ (see pictures below), so any hint can help us further to track it down in history. 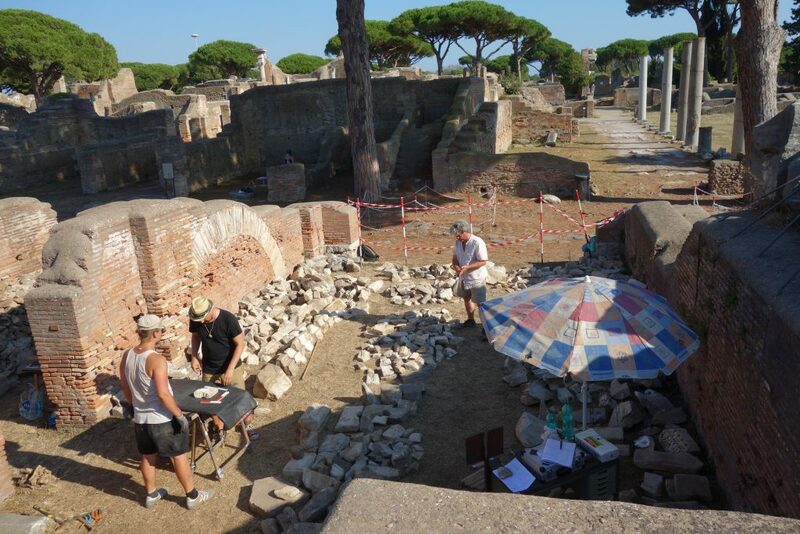 The first hint was already Daniel’s observation that the only complete marble roof-tiles were found on top of the marble-deposit, but none inside or underneath the pile (if at all, they were only small fragments). 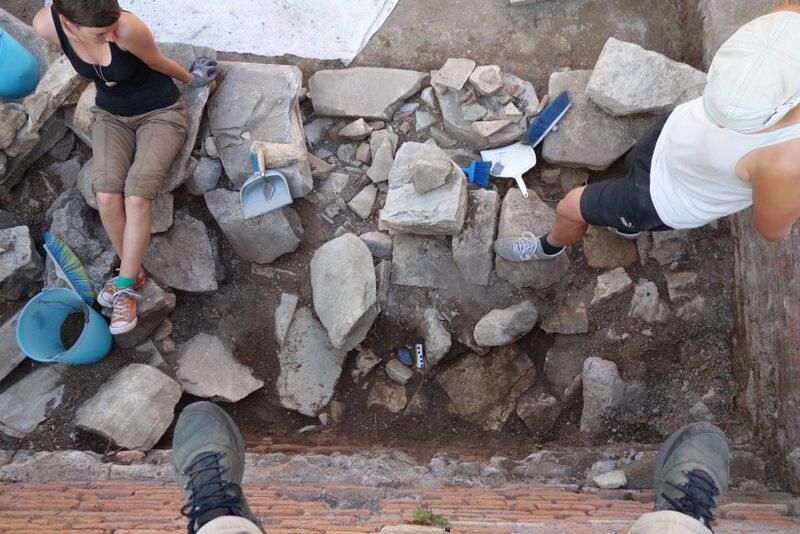 This suggests that the first excavators of 1801-1805, which were reported to have found big and complete parts of the Capitolium’s marble-roof, had found those and deposited them on top of an already existing marble-pile. 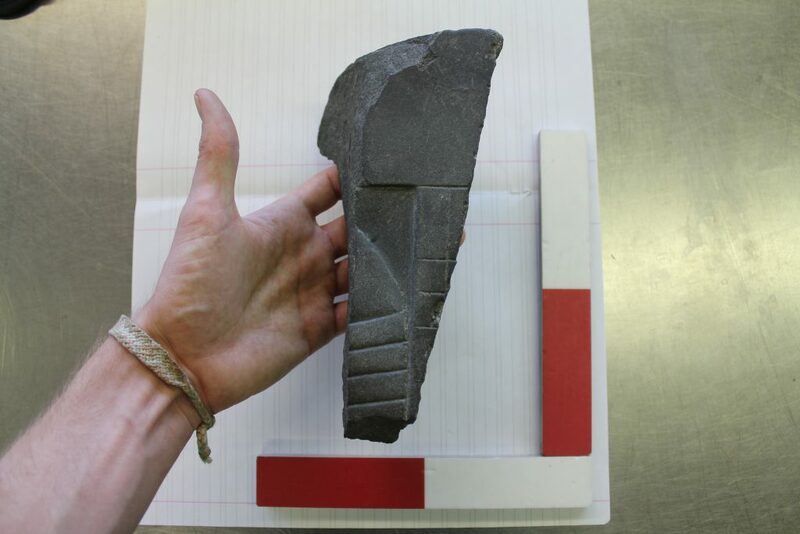 In contrast to that, our pile itself consists of already cut fragments, which underwent deliberate fragmentation with the purpose of fitting the pieces into a lime-kiln. 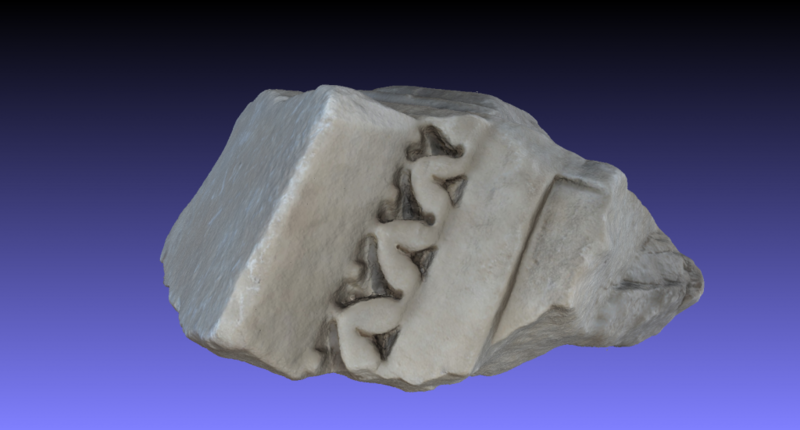 A simple rule was verified by that: If we find (almost) complete pieces of architectural decoration, they either come from areas, which were already covered in Late Antiquity or these pieces were re-used in late antique building-contexts (where they were needed and therefore not removed with the purpose of burning them to lime). 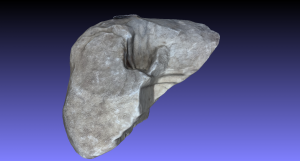 If we find smaller fragments (mostly with clear chisel marks of destruction-processes), they come from the marble-deposits of lime-kilns, either late antique examples or medieval ones (mostly 5th to 7th centuries AD, with a smaller peak of distribution in the 10th-12th centuries AD). 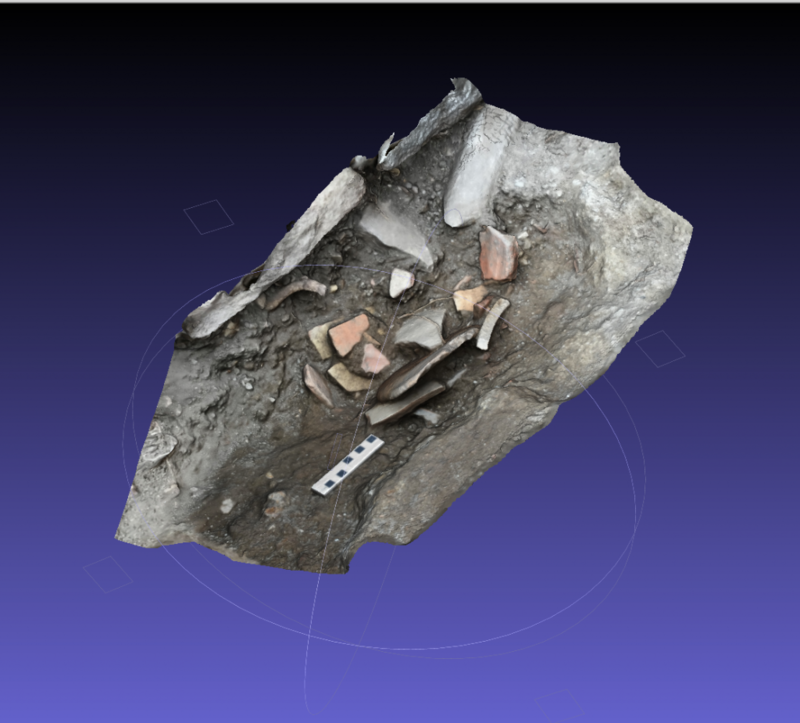 Detective-work now seems to connect our new evidence with the old excavations directly. 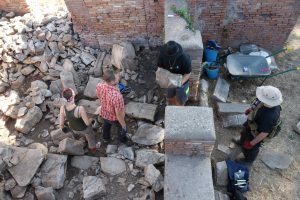 On one hand we can work up old finds scientifically even after more than 150 years, write the former excavation-history in detail and thus understand the old excavations better. 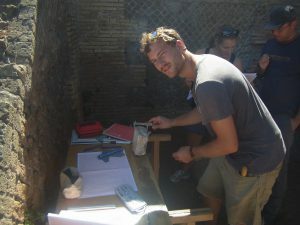 On the other hand, the old diaries allow us to re-locate and understand our new finds in their original depositing-context: the temples and marble-buildings of the Forum! 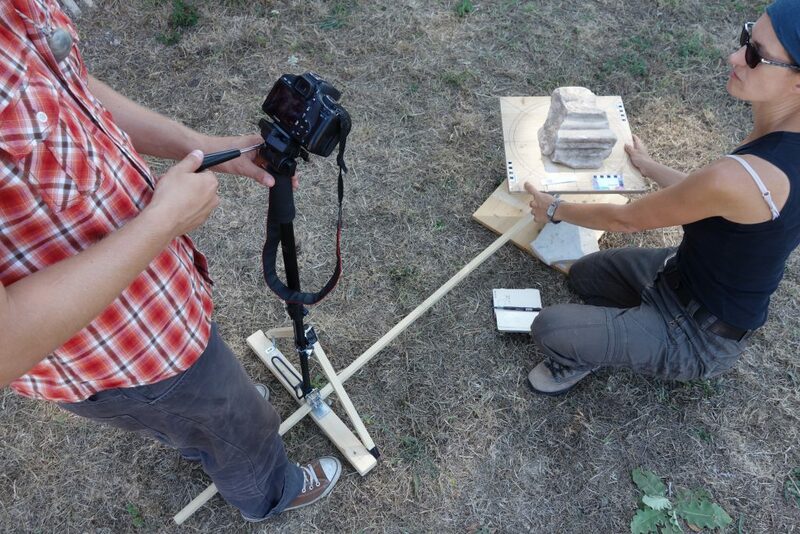 Surprises form a nice part of field-archaeological business. 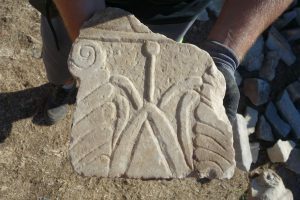 This can be stated as a title for the ongoing excavations in early September 2016. 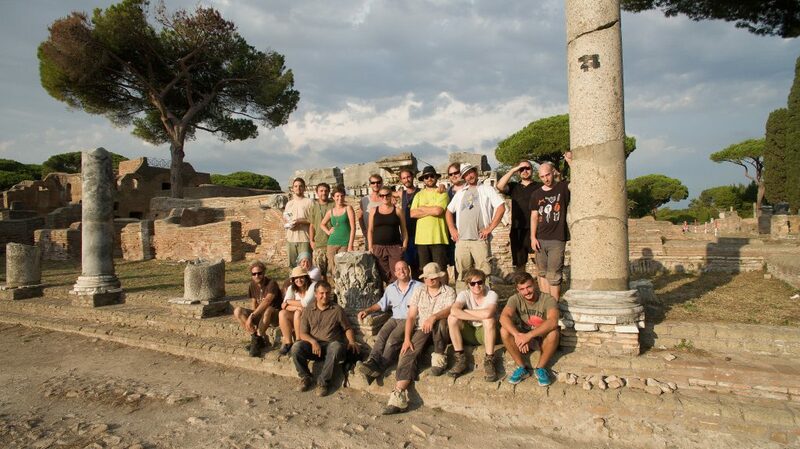 What we were prepared for, was to analyse a marble deposit (see pictures below top: measuring, drawing & fotographing all single fragments in 2-D and 3-D, which was done by Lydia, Johannes, Laura, Marco, Felix, Christin, Rocco, Fabian, Iannis, Helge and many others. 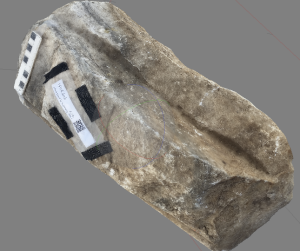 See picture below bottom: Next step is to group the fragments according to stylistic, typological and functional categories, a job well-done by Daniel of course and to create a catalogue via QR-codes used on smartphones, a new system initiated by Laura into our excavation-workflow). 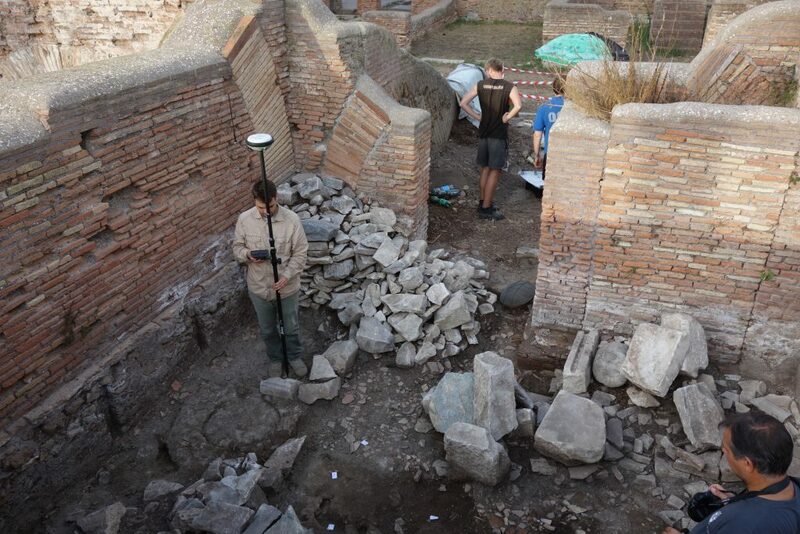 What we did not expect were the massive amounts of non-marble finds in the context of an originally late antique/medieval and/or 19th century-marble-deposit. It started with “Andi’s corner” (see picture below with Andi standing to the right in ‘his’ corner). 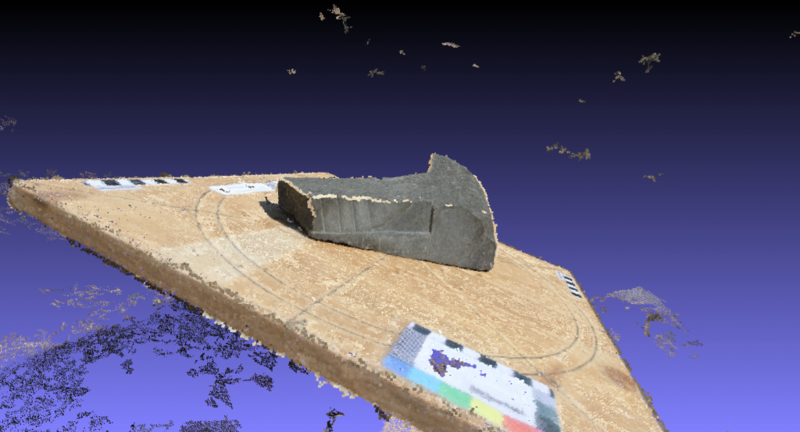 First we have documented the room by a 3-D-model which was georeferenciated by our Hungarian colleagues (see pictures below). 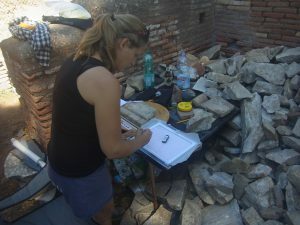 In the southwest corner of the room we found an exceptional concentration of travertine blocks, well sorted as a fundament – but underneath without an own fundament (see picture below top: lower left corner, see picture below bottom: detail turned 90 degrees left). 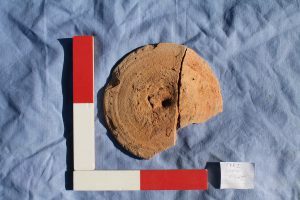 A large fragment of a “patera”, a Graeco-Roman sacrificial plate of a specific type often depicted on altars (see picture below top), was found there (see following pictures below bottom). 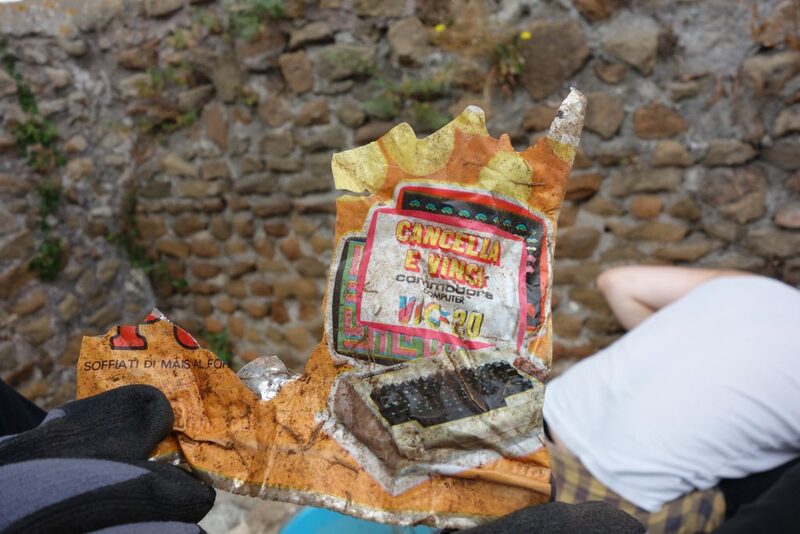 It was situated at a level where stratigraphy started to be significant, that means: not being disturbed top-soil consisting of differently designed Coca-Cola-bottles or computer advertisements from the past 30 years (see picture below top). 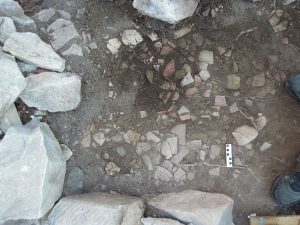 Later it became clear that an original depositing-level was reached, when the stones laid in the room were stored on plane ground at the same level as a ceramic floor of antique origin, which filled a corridor-like space between the stone-piles (see pictures below bottom). 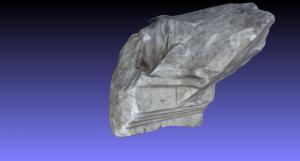 Some objects could be dated immediately, even without being removed. 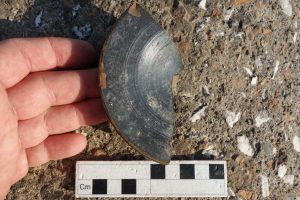 The majority consisted of fragments of cooking pots, plates, lits and kitchen equipment. Therefore, our deposit, originally believed to be modern, had become older and older – obviously even as old as a still-antique period after the end of the kitchen-use. The kitchen obviously underwent a complete functional change, which had occurred maybe in the later 5th and 6th centuries AD! Notwithstanding, the history of the room did by far not end with that! 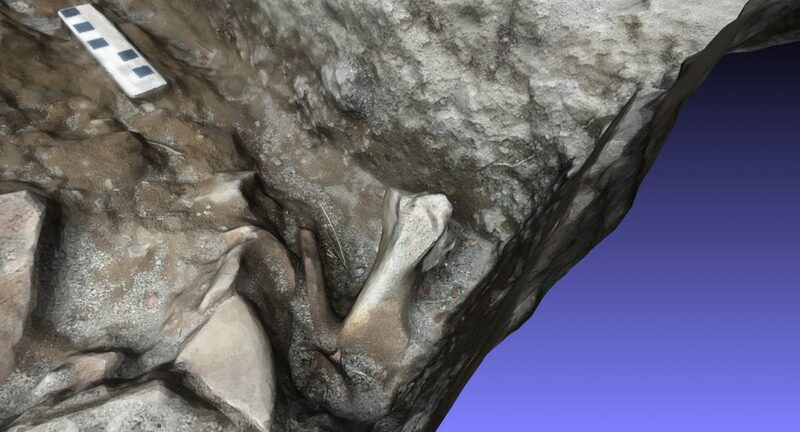 The random-ceramic-floor underneath the marble-deposit presented several further surprises. 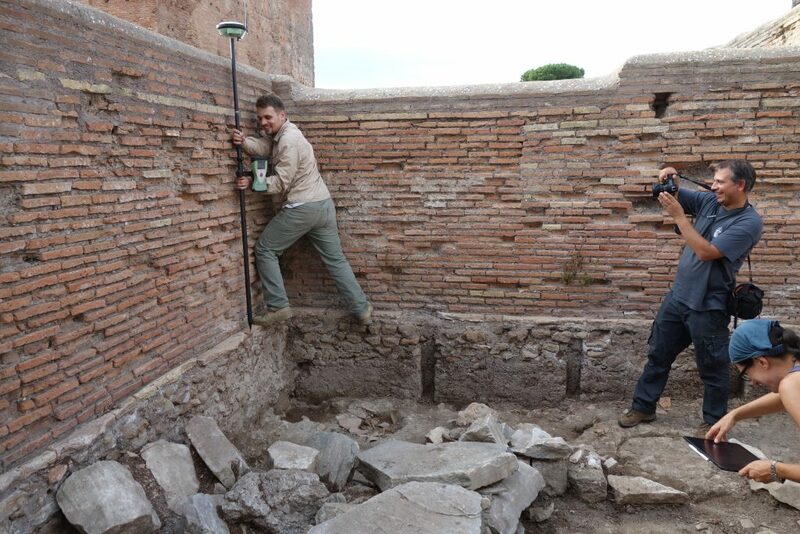 Today, we see the ‘Hadrianic’ walls (of the 2nd century AD: see pictures below). What remains completely missing however is the Hadrianic floor, probably of opus spiccatum as in the adjoining rooms to the south and to the east where probably once was the lime-kiln (until its complete excavation in 1913). 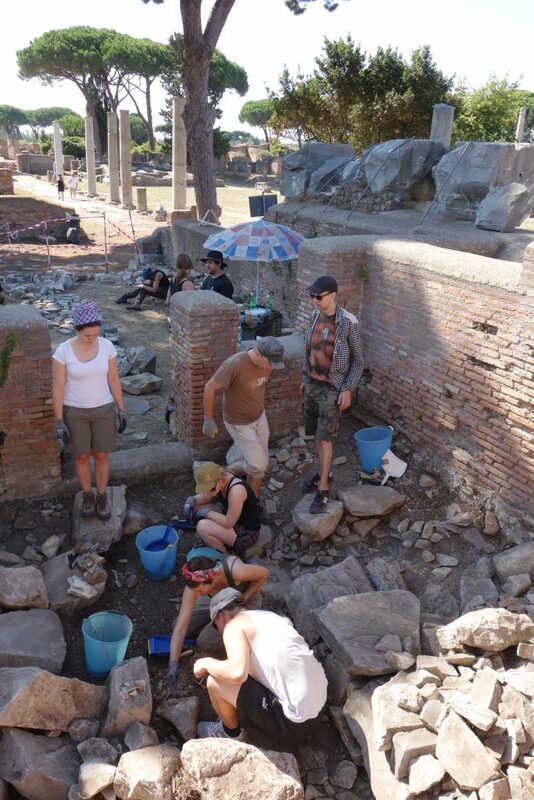 What we had found instead, is on the one hand the infrastructure of a kitchen with a half-buried type of dolium (oil or wine container, see picture below), which respected the room-layout of the 2nd century AD, characterized by the fundament visible left in the picture. On the other hand, several layers of a similar type of random-ceramic floor or filling went further back into history (Augustean times and earlier) and did not respect the layout of the Hadrianic room. 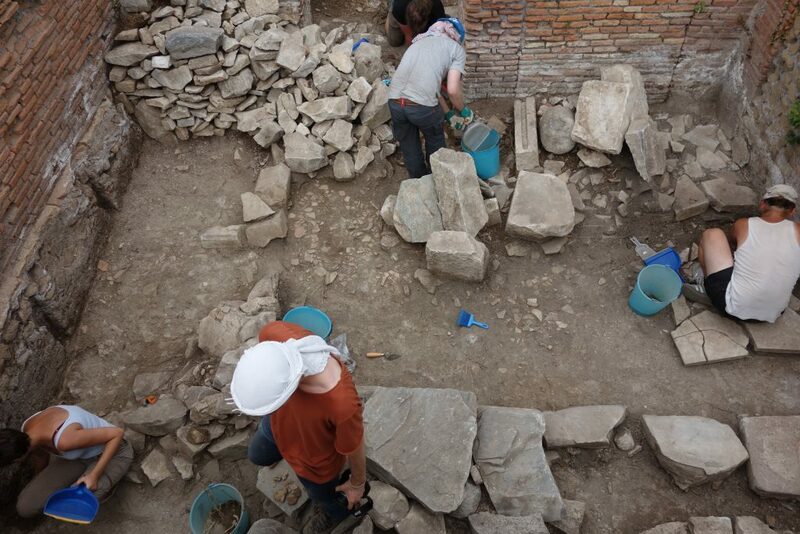 So far, – without further excavation – we have documented a destruction-layer immediately before the building of the Hadrianic room (fire 117 AD?) 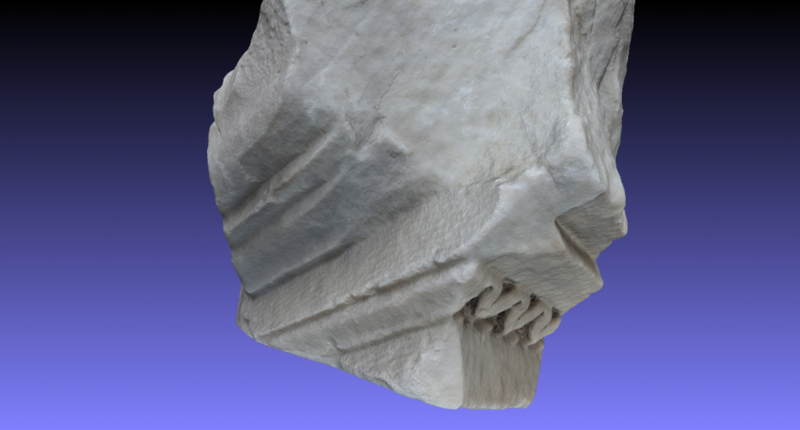 at the same level of the room’s late antique re-use as a temple’s marble deposit (later 5th/ 6th century AD onwards). 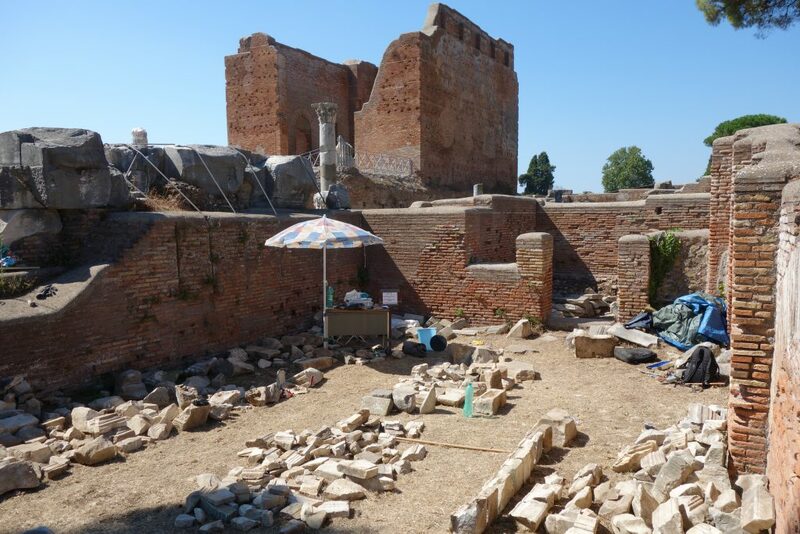 It could be a coincidence again – but the kitchen’s last use seems to have taken place when the old Forum’s temples of Ostia were demolished and cleared up after a fire in 117 AD (?). 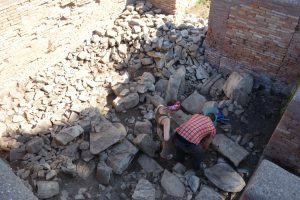 When the temple ruins were removed and cleaned away, the oldest material from these temples could have entered our deposit. 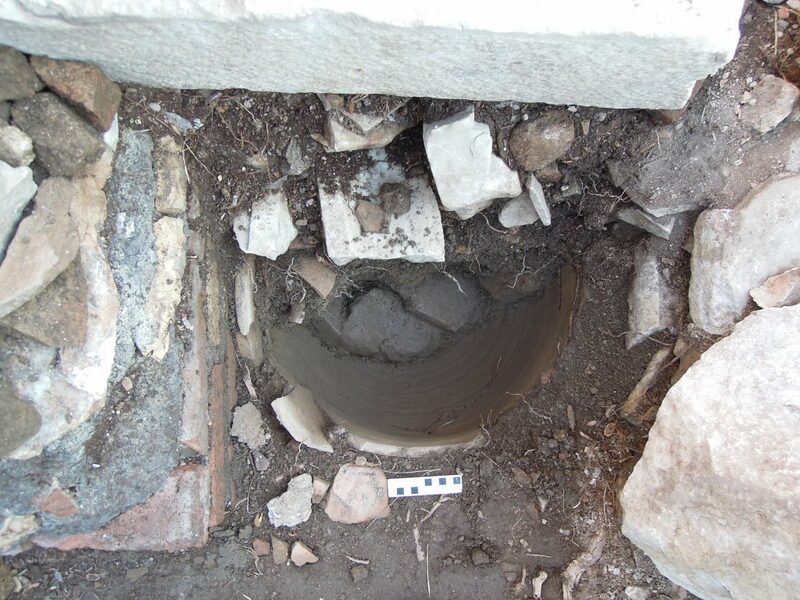 This destruction-event had sealed a well, which by construction technique can be dated to late Republican times (1st century BC). The oldest cultic deposits, which we found inside this well go back to the 3rd and 2nd centuries BC. 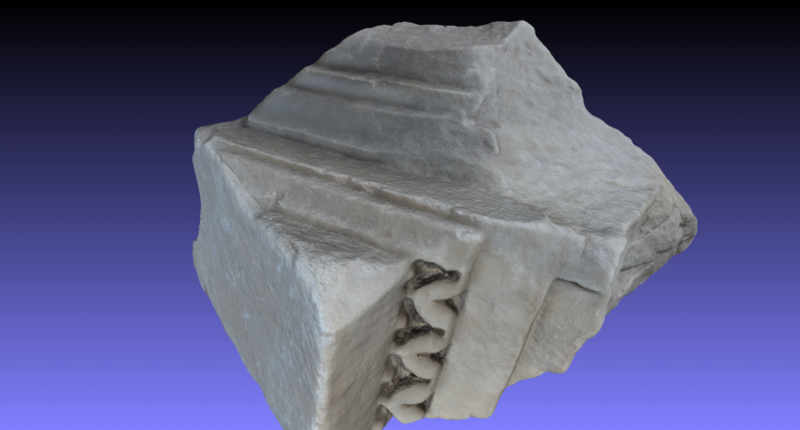 We developed the working-hypothesis that we had found a cultic kitchen connected with the Capitolium’s pagan practices, public feasts on the Forum. 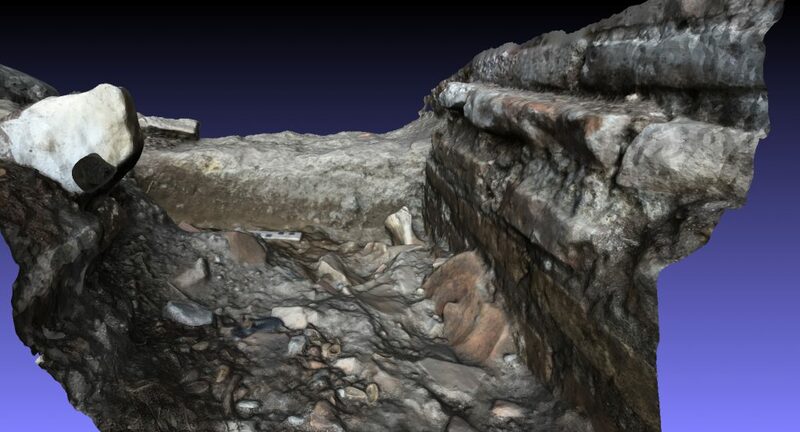 One clear evidence seems to be the large amounts of lits (see pictures below top), which we documented on the surface in their original context by 3-D-models (see picture below bottom). 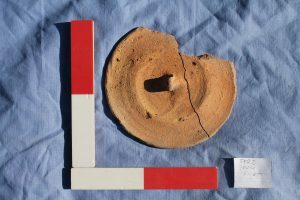 As frequently found in temple-contexts of the whole Graeco-Roman world, these lits once covered little ceramic bowls in which the meat of the sacrificed animals was served to the spectators. 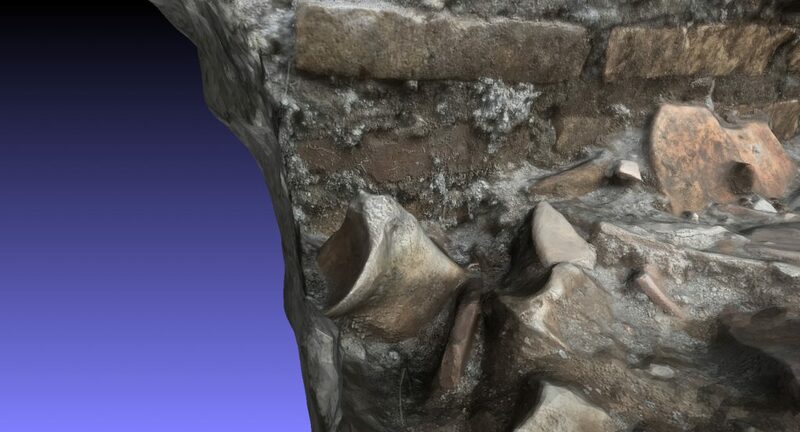 So, it is hardly another coincidence that we have found in one room-corner a surface of a bone-deposit, which seems to have consisted of several big bones of bulls, maybe even with cutting-marks on the bones themselves (see pictures below, which show a 3-D-model of this corner. 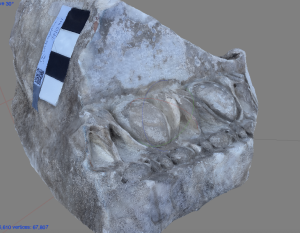 Due to reasons of conservation after fotographing we left the bones covered in their original context waiting for further specialized analysis). The area of our room thus may have served for the preparation and cooking of the meat (an ancient ceramic-grill once fired with charcoal was found too, see the following chapters). 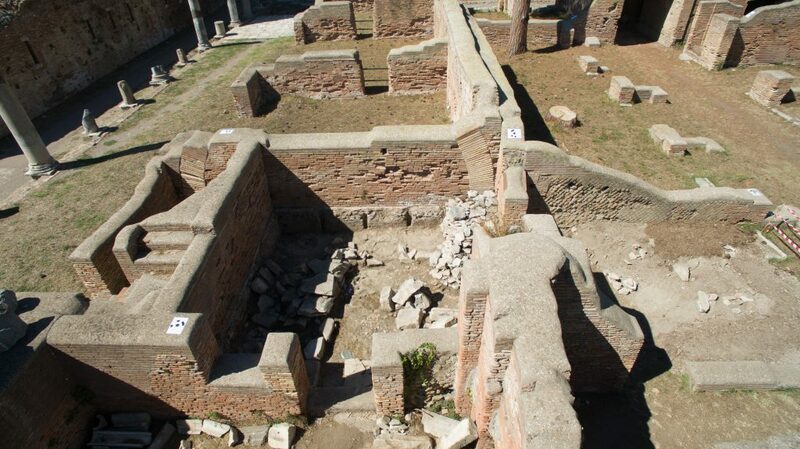 The hot meat probably was served in ceramic-bowls to the Forum, where the guests would have been seated. 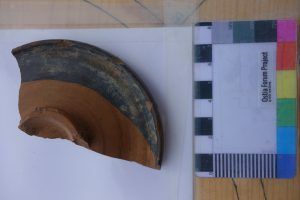 These bowls are now completely missing in contrary to their lits, which obviously had been thrown away to the corner with the bones before serving and which were later found by us there in situ. 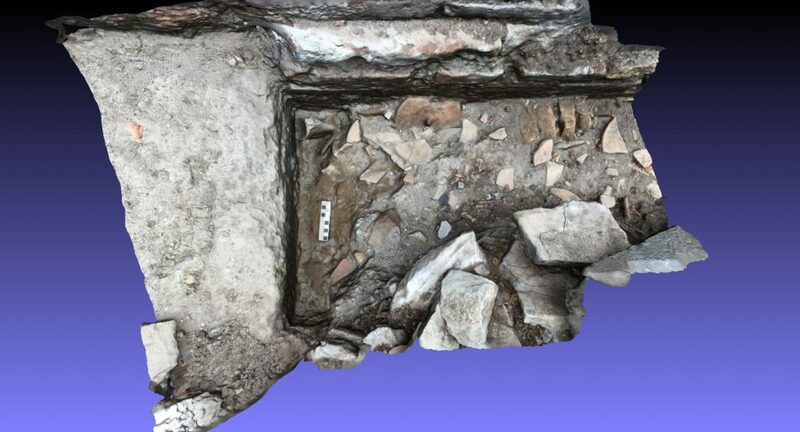 So, this kitchen was found in a state of preservation almost as in Pompeii: this exceptional fact is due to the circumstance that it was covered immediately after the fire of 117AD(?) 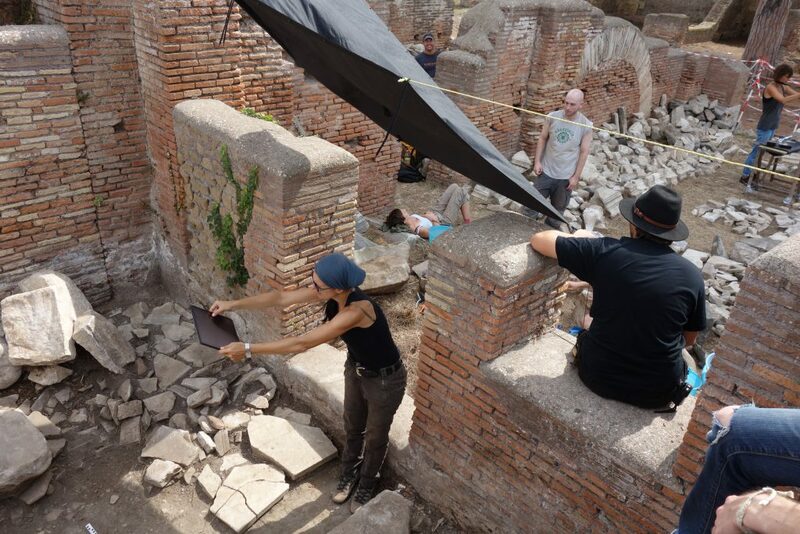 with the 70cm higher fundament of the Hadrianic room. 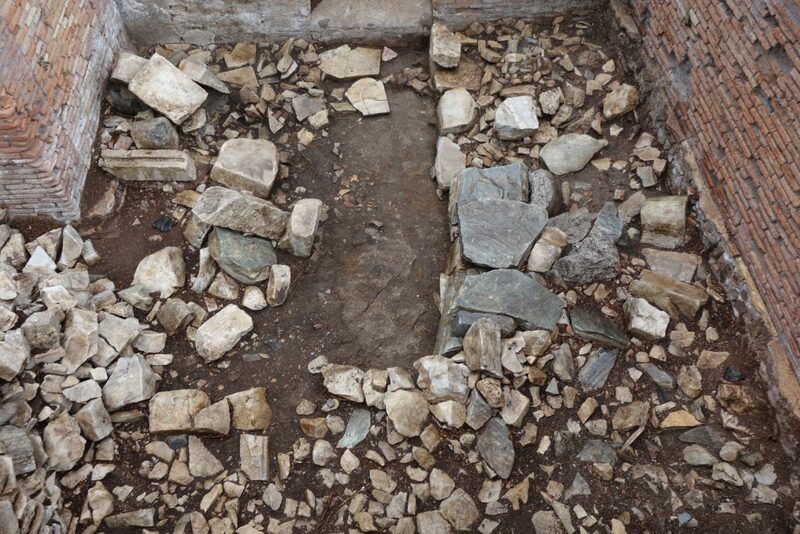 Later in Antiquity – after the removal of the Hadrianic floor – it again was sealed by heavy stones, which had been an equally appropriate cover for almost two millennia! 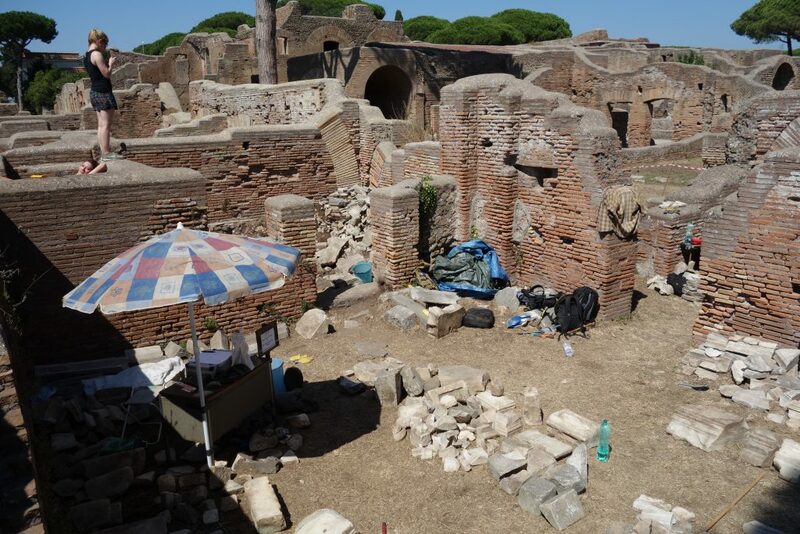 This kitchen originally had predecessors directly connected to the historical setting of Ostia’s early (and maybe even earliest) temples of the 3rd to 1st centuries BC, buried underneath the Capitolium and its surrounding porticoes. The team (see picture below) is ready for new tasks! Our next chapters follow soon!